In economics and business, a network effect (also called network externality or demand-side economies of scale) is the effect that one user of a good or service has on the value of that product to other people. When a network effect is present, the value of a product or service is dependent on the number of others using it. The Apple Watch (check “Here it is: The Apple Watch” for all the details) is an amazing gadget, no matter what all the Android fanboys are saying about it in the many comments you’ll find all over the Web. It would sell well even if it only contained 50 percent of its functionality. The fact that you need an iPhone to use it isn’t even a bug, but a feature. It appears to work so well with the iPhone, almost symbiotic, that the whole (combination Apple Watch + iPhone) is greater than the sum of its parts. But that’s not all. The Apple Watch is also the first product that really starts making sense as soon as more people (who you know) start using it. You can own a MacBook, an iPhone or an iPad and be perfectly happy in a world dominated with competing platforms. You can make phone calls to any other phone. You can browse the web, handle email, read books and watch movies. There’s hardly an incentive to persuade your partner, co-workers or anybody else to also switch to your platform. The Apple Watch however is made to connect to your friends. The communication level is intimate as opposed to professional. You wouldn’t share your heartbeat with a co-worker or customer. That kind of communication is reserved for friends, family and the people in your life that you love. The Sketch, Walkie-Talkie, Tab and Heartbeat modes of communication look magical and original and unlike anything we’ve ever seen in a gadget. 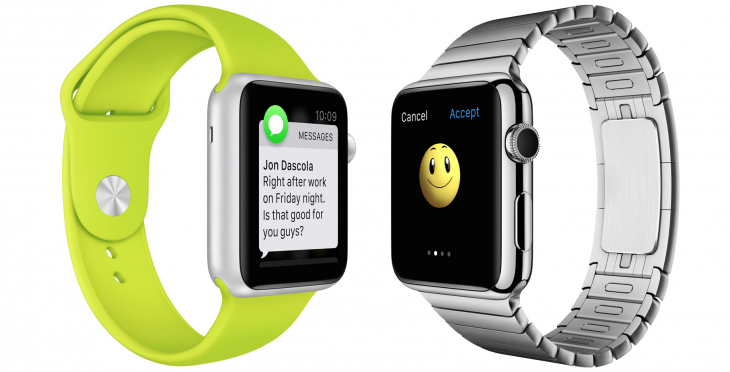 Once you own an Apple Watch you’ll want your husband or wife or love interest to own one as well. The communication methods are burning a hole in your pocket begging to be used. But who will you use it with? Surely when it goes on sale there will be fans lining up around the block to get their hands on the first ones. Pretty soon after that I expect a second wave of sales from those same early adopters buying another one, or persuading their close friends to get one. Then we can expect a third wave of people, and a fourth, and so on, leading to a viral and exponential growth and sales curve equal to the growth we’ve seen for social networks like Facebook and LinkedIn. The Apple Watch won’t just be a bestseller because it is a shiny and cool object, but because it becomes better and more useful if all your friends have one too. I don’t think Apple has managed that with a gadget before, and it’s a pretty exciting development.